Two major second messengers are recognized. The first to be characterized, by Sutherland and Rall in the 1950s, was the compound adenosine-3',5'-cyclic monophosphate, now referred to as cyclic AMP (cAMP). An early example of work involving measurement of this compound in brain tissue was the determination by Kakiuchi et al. (3) that electrical stimulation of isolated guinea-pig cortical slices leads to a 10-fold increase in cAMP levels. Characterization of the adenylate cyclase enzyme that forms cAMP from adenosine triphosphate, and of the phosphodiesterase enzyme that degrades cAMP to adenosine 5'-monophosphate (AMP), in brain tissue was followed by the discovery, largely by the group led by Greengard, that adenylate cyclase can be stimulated by neurotransmitters such as noradrenaline (norepinephrine), dopamine, and histamine, thus providing a basis for the action of cAMP as a second messenger in neurones possessing receptors for these compounds. The other major second-messenger substance is inositol-1,4,5trisphosphate, a water-soluble compound derived from hydrolysis of the membrane phospholipid phosphatidylinositol-4,5-bisphosphate by the enzyme phospholipase C. The phosphatidylinositol cycle in which turnover of the membrane-bound phosphoinositides, which constitute about 5 per cent of membrane phospholipids, is stimulated by neurotransmitters such as acetylcholine, was first observed by Hokin and Hokin in 1953. However, the importance of this process was not recognized until Michellshowed that phosphoinositide hydrolysis was linked to an increase in intracellular calcium ion concentration. A further stimulus for the study of this pathway was provided by the work of Berridge et al. (5) who demonstrated in 1982 that lithium inhibits the phosphoinositide cycle and leads to depletion of brain inositol and accumulation of inositol phosphates. Although it was initially uncertain which of the various molecules phosphatidylinositol, phosphatidylinositol-4-phosphate, or phosphatidylinositol-4,5-bisphosphate is hydrolysed under conditions of neurotransmitter stimulation to form a second messenger, it is now clear that the relevant molecule is phosphatidylinositol-4,5-bisphosphate, and that inositol-1,4,5-trisphosphate is the active second messenger while inositol bisphosphate and inositol monophosphate, in their various isomeric forms, are breakdown products of inositol-1,4,5-trisphosphate (Fig,...2). Another route of metabolism involves phosphorylation of inositol-1,4,5-trisphosphate to inositol-1,3,4,5-tetrakisphosphate, which is then broken down by a phosphatase enzyme to inositol-1,3,4-trisphosphate. 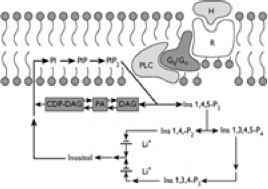 Inositol-1,4,5-trisphosphate acts by binding to receptors on the endoplasmic reticulum and releasing calcium ions into the cytoplasm. Calcium itself has many functions within the cell (see below) and is thus also often referred to as a second messenger. Hydrolysis of phosphatidylinositol-4,5-bisphosphate also leads to the formation of diacylglycerol, itself a second messenger which acts by stimulating the enzyme protein kinase C (see below). The cycle is completed by resynthesis of phosphatidylinositol by transfer of the phosphatidic acid moiety from cytidine diphosphate diacylglycerol to myoinositol. 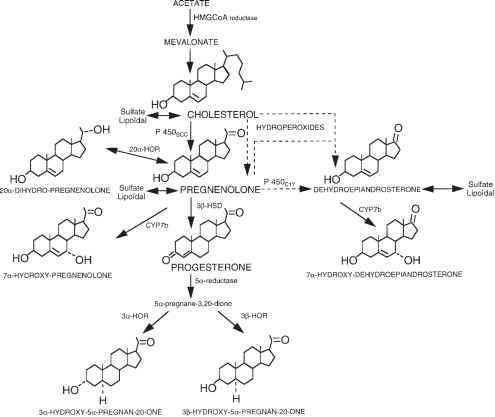 This process is essential to the maintenance of a sufficiently high level of phosphoinositides, since in most tissues inositol is not taken up from the bloodstream, and must therefore be provided by intracellular recycling.